If Apple does launch a new, larger iPad with a 12.9-inch display this year, a new report from the Republic of China suggests that the device could ship with an upgraded "A8X" variant of the A8 introduced alongside the iPhone 6 series, while the next-generation iPad Air might double the RAM of its predecessor. 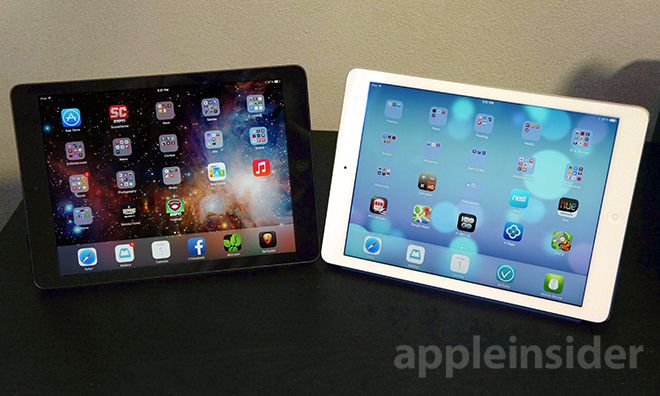 The iPad Air is currently Apple's largest tablet with a 9.7-inch display. The so-called A8X would be manufactured in conjunction with Taiwan Semiconductor Manufacturing Co., the same firm that builds the A8, according to TechNews.tw. The report was first noted by GforGames. Rumors have long pointed to an eventual jumbo-sized tablet from Apple, though numerous reports have indicated that it is unlikely to launch this year. If the "iPad Pro" does materialize, the move to an upgraded A8X chip would not come as a surprise. The quad-core Imagination Technologies graphics processing unit in the A8 has been shown to struggle with the scaling required on the 5.5-inch, 401-pixels-per-inch display of the iPhone 6 Plus, with some users reporting stuttering in various system components. The publication also reiterated its previous prediction that the second-generation iPad Air would gain an additional 1 gigabyte of RAM. Relatively little else is known about the new tablet, which is likely to be unveiled late next month, though it is expected to add the A8 and a Touch ID-equipped home button.